From the very earliest of civilisations, fashion has been one of the most significant components of a community’s culture, and a means of expressing endless messages. Whether one is using it to represent social status, wealth, class, vocation, or personal tastes, it can provide an insight into what values and traditions were held by the wearer and the society of the time. The 19th century especially was an era in which appearances were paramount and a woman’s wardrobe could tell the story of her world. At the onset of the 19th century, the Western world was undergoing massive changes and the first few decades were marked by conflict and political instability. Most notably, the Napoleonic Wars shook the foundations of Europe as France attempted to forcibly expand its empire, and Britain had no choice but to deem the mentally ill King George III unfit to rule, appointing, the unfavourable Prince George of Wales, to rule in his place as Prince Regent. Furthermore the beginnings of the Industrial Revolution were already taking effect and the shift to an economy based on industry and mass manufacture left many agrarian and handicraft workers uncertain of the future. 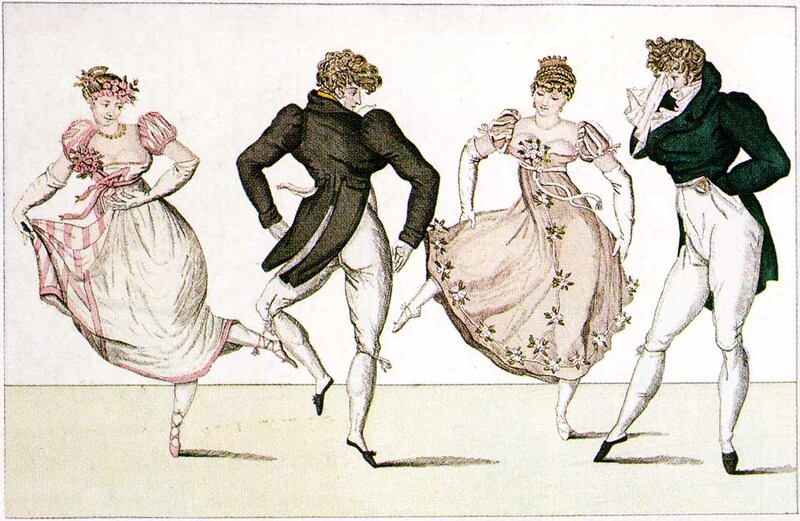 Despite this, The Regency was a period of great advancement in the arts and culture in Europe, and the emerging fashions of the time were reflective of this. Following the disastrous events of the French Revolution, people did not wish to appear to be a member or sympathiser of the French aristocracy, and fashion trends moved away from frilly extravagance to more natural and modest silhouettes inspired by the imagery of Ancient Roman figures. An emphasis was placed on mobility and practicality over gaudiness even amongst the upper classes; the idea was to allow one’s own true self to speak for their identity rather than clothes worn on the body. 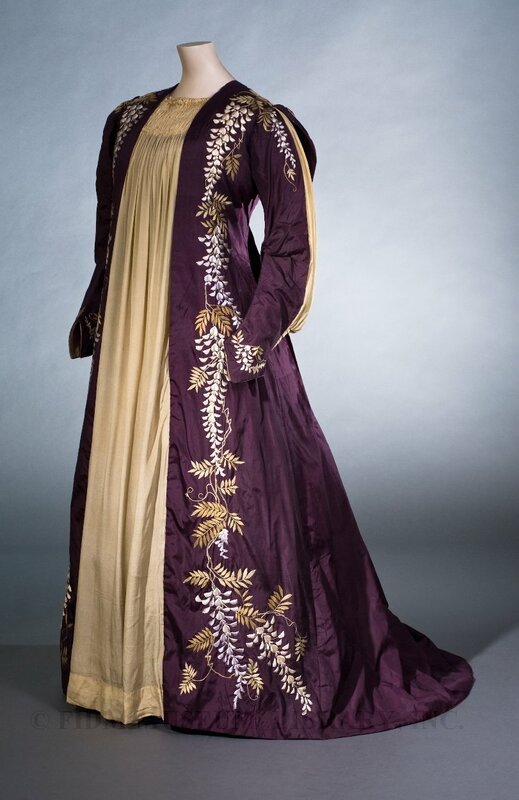 However, after the coronation of Queen Victoria in 1837, fashions became more focused on modesty and constraint as gender roles grew more defined and greater value was placed on the female as a protector of morality and order in the household. Being delegated to the domestic sphere away from the male dominated public and professional world, women were perceived as innately physically weak, fragile, and in need of support; this could be provided by the laced corset, which was intended not only for the practical use of supporting the chest and enforcing a healthy posture, but to mold the body into the fashionable shapes of the decade, not unlike modern shapewear. The early decades of the Victorian era emphasised a low, narrow waist which extended over the hips and was emphasized by a full skirt supported by multiple layers of horsehair petticoats, and later on by cage-like structural crinolines. 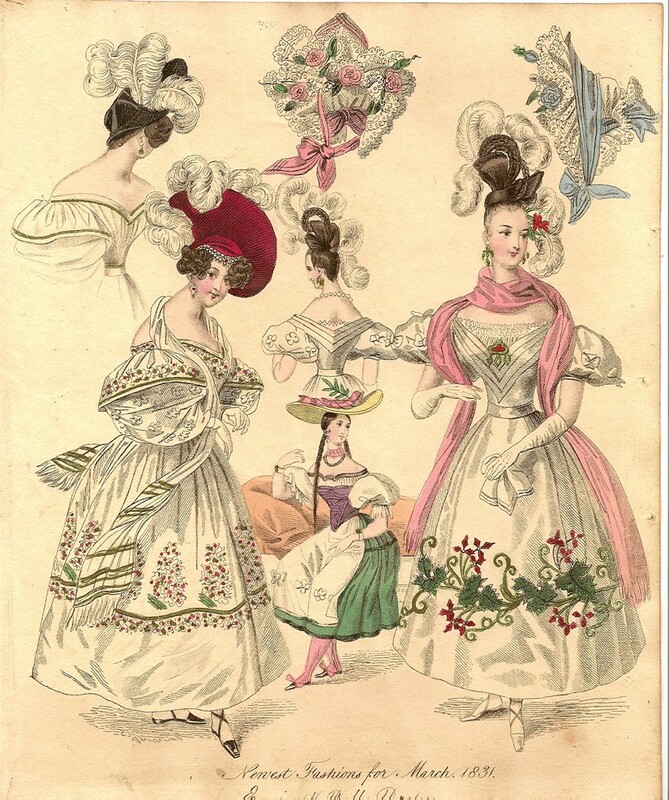 Unique to the 1830s were gigantic puffed sleeves that required down-filled ‘sleeve pumpers’ to be worn underneath, as well as elaborate hairstyles featuring ringlets, loops, and braids, accessorised with large, generously decorated bonnets. The 1840s, though generally maintaining a similar silhouette, were characterised by tight, off the shoulder sleeves and less flamboyance compared to the previous decade. 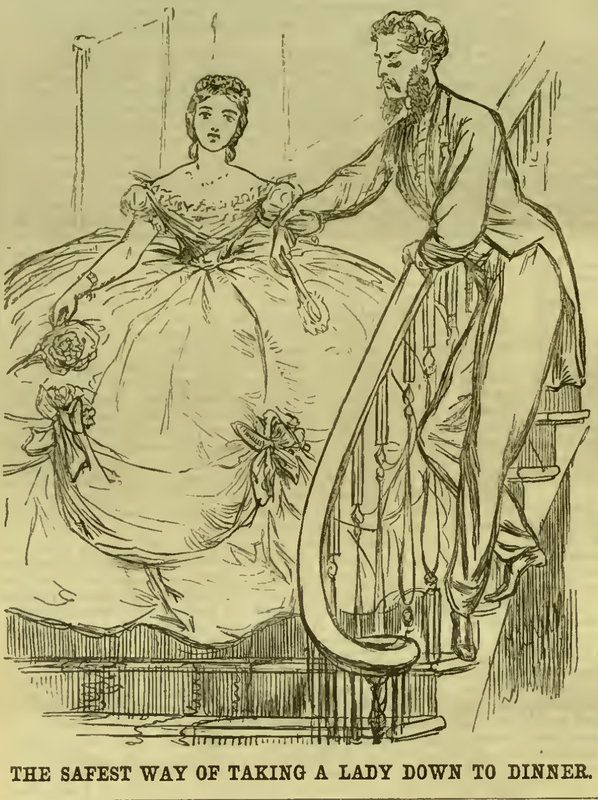 In the 1850s, the crinoline hoop skirt was made possible due to innovations in steel technology and thus skirt shapes grew ever more larger, even inciting ridicule from some satirical publications. In the 1860s crinolines became more conical than dome-shaped, and fullness increased at the back where a train was now often worn. During these decades the invention of artificial dyes and the mass production of sewing machines encouraged experimentation in textiles and dress construction. 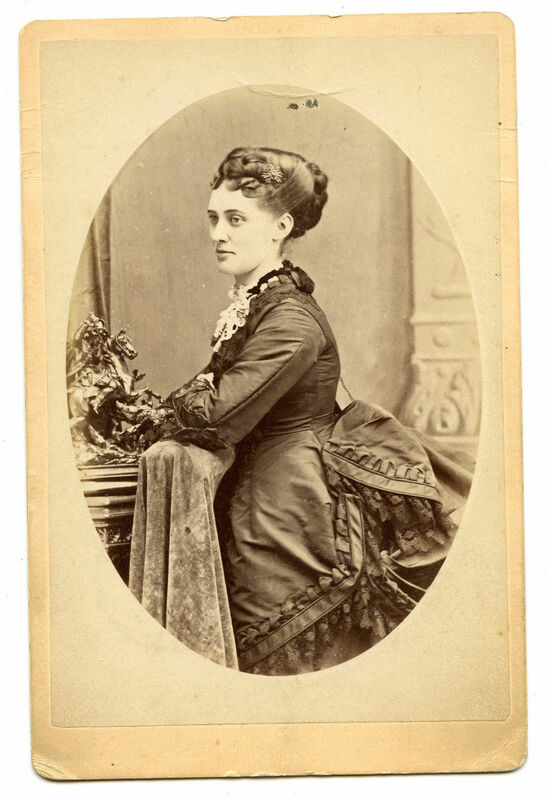 The 1870s saw the eventual disappearance of extensive skirts, and a thinner, more tightly bound figure gained popularity, with the exception of an exaggerated rear achieved by a bustle or tournure. The nature of the narrow skirts could make it more difficult for the wearer to walk freely, however it was a slight improvement from the weight of the excessive petticoats and underskirts used to achieve the voluminous shapes of the previous decades. It was often the case throughout the Victorian Era that fashions could cause great discomfort, for both men and women although perhaps more so for the latter, but it was seen as necessary in order to convey one’s wealth, status, and even their sense of morality. If a woman was not dressed or laced up properly, she could be considered of loose character, so to speak. During the 1880s, a small variety of subversive fashion movements gained some momentum amongst the middle classes. Aesthetic Costume prioritised simplistic beauty and opposed excessive frill and trimming. Similarly, the Rational Dress movement rejected tight laced corsets in lieu of more practical garments that allowed for mobility, and freedom from constant discomfort. Although, however notable, these movements were not widespread and mainstream fashions remained heavily decorated and highly structural. However, such alternative trends were reflective of women taking initiative to challenge their roles in society and demand better treatment, and thus the beginnings of social change were indeed brewing. In the 1890s, waistlines were tiny and placed at the natural level while skirts adopted a bell shape that laid more tightly around the hips, with crinolines and bustles being abandoned entirely. Necklines were high and though sleeve sizes fluctuated, they always remained fitted around the wrists. 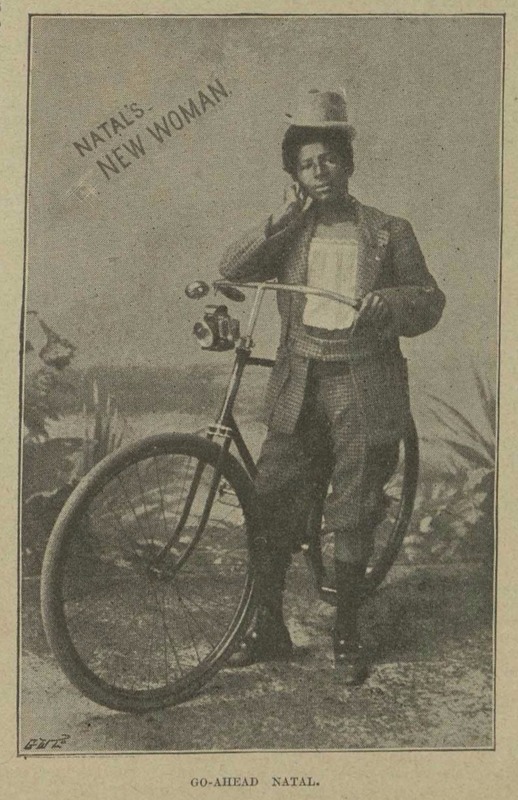 The popularisation of the bicycle and its accessibility to women required garments that allowed for more ease of movement. These included skirts that fell above the ankle, and even bloomer-styled pants. 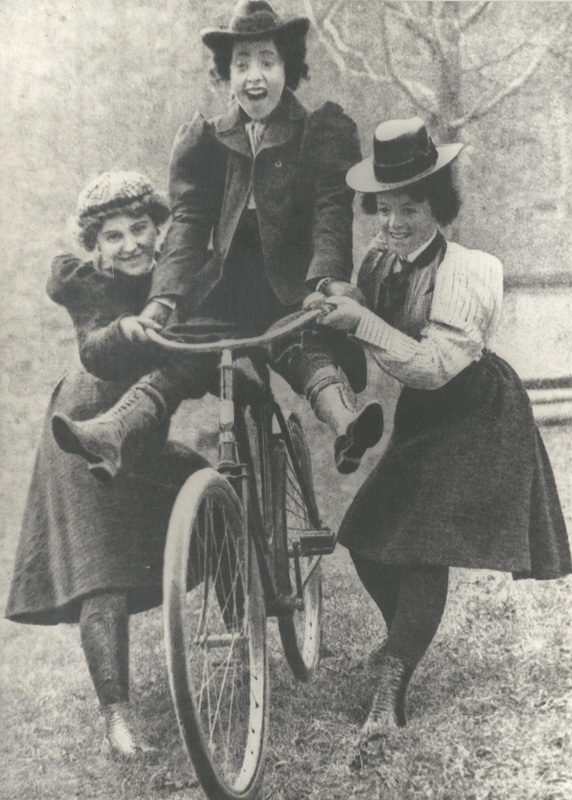 As more activities and professions became available to women compared to earlier decades, their fashion diversified and came to reflect the austere and uncomplicated quality of men’s clothing. Tailored coats and shirtwaists of this nature were highly popular, and slightly raised hemlines became acceptable for day wear. This decade, though still corseted and cinched in, marked a noticeable shift in womenswear as first wave feminism cusped on becoming fully fledged and fashion saw the beginnings of the transition from the woman as an 'Angel of the Household’ to the liberated ‘New Woman’. 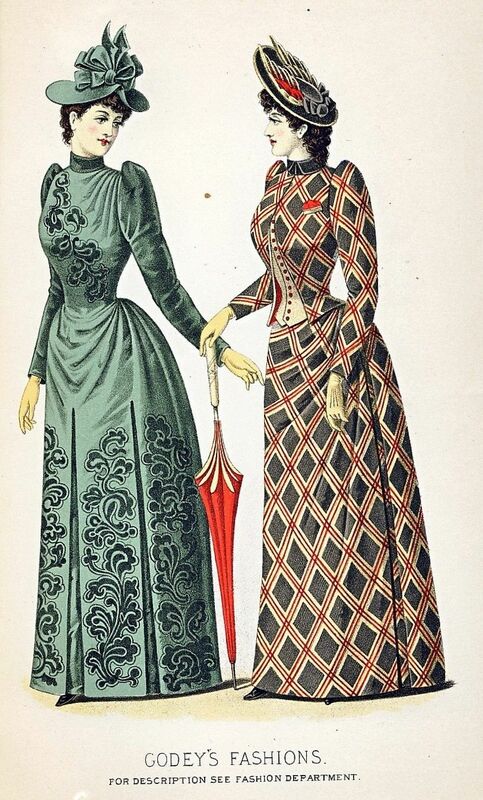 The evolution of fashion during the 19th century provides insight into the time, telling a story of changing tastes, values, and politics in Western culture. From the lightweight classic silhouette of the Regency, to the structural volume and excessive flounce of the mid Victorian years followed by the rebellious phenomena of the Reformed Dress Movements, the era demonstrates a succession of shifts in how femininity was defined and perceived by the public and women of the era. By the end of the century, fashion trends indicated the actively changing role of women in society and were a precursor for the eventual liberation that was to come in the following century.